Harper Meyerson, 15, served as a page in the Washington State Senate during the week of January 15. Pages are sponsored by the senator from their legislative district. 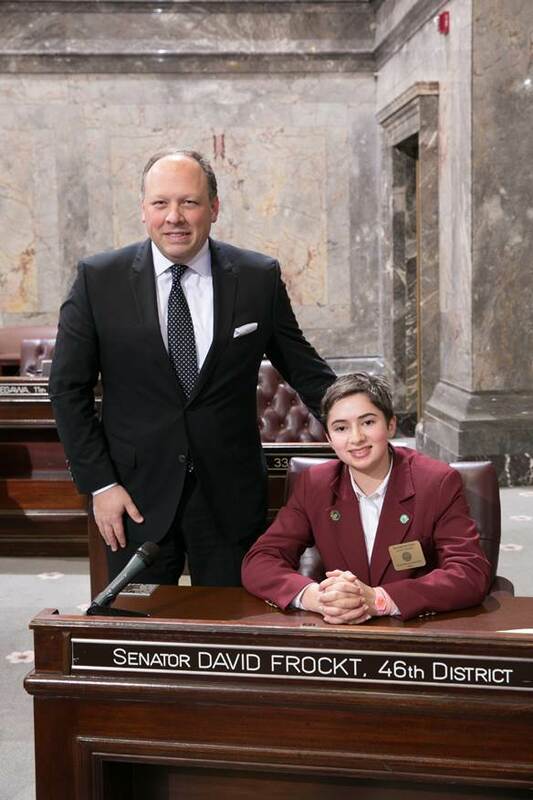 Sen. David Frockt, D-Seattle, sponsored Meyerson’s week in the Legislature. The page program offers a hands-on opportunity for students to find out how state government works. The interactive learning experience includes classes focused on topics like budget writing and how a bill becomes a law, which culminates in pages creating their own bills in a mock committee setting. The educational experience is furthered by guest speakers. “What I’ve learned most while being a page is that government is both more complicated and less formal than people think,” said Meyerson. ”I was surprised that legislators really want to hear what their constituents think,” Meyerson added. Meyerson is in 10th grade at Lakeside School. She enjoys swimming, ultimate Frisbee, and working on the yearbook at school.